Boot-stomping music lures you to Tennessee, but if you manage to tear yourself away from a never-ending roster of stellar gigs, there’s no shortage of alternative entertainment. First though, cast your peepers over an incredible line-up of 2 million artefacts at the snazzy Country Music Hall of Fame in Nashville, which boasts its own songwriting stations where you can pen a tune of your own. Hit Beale Street in Memphis, home of the blues and the birthplace of rock 'n' roll, where the likes of BB King and Isaac Hayes have wowed audiences. Or visit Bristol in September for the phenomenal Rhythm & Roots Reunion, three days of electrifying musical magic. Be sure to visit the fabulous Birthplace of Country Music Museum while in town. Powerful as Tennessee’s musical roots are however, be bold and dip your toes into something different. Arrive in Knoxville in summer, and you can chuck a blanket on the grass for an evening of Shakespeare, gratis. Cruise round the 13km (8mile) Gatlinburg loop and stuff your suitcases with stained glass, jewellery and watercolours produced by the Great Smoky Arts & Crafts Community, the continent’s largest group of independent artisans. 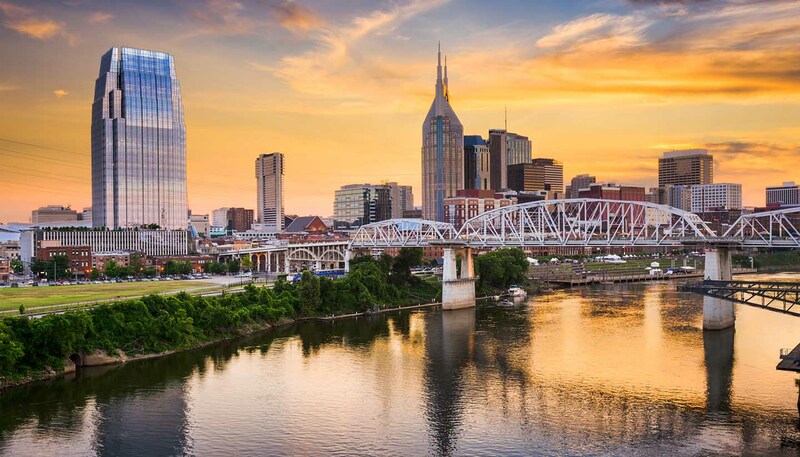 Soar like an eagle on a 21-storey-high rollercoaster at Dollywood, roar like a bear at a Memphis Grizzlies home game or follow in the footsteps of Native Americans and Civil War soldiers along legendary trail Natchez Trace. Whatever you do, you’ll find Tennessee to be one big adventure playground, encompassing forested mountains, cypress swamps, white-water rapids and cascading waterfalls. The Great Smoky National Park alone racks up 1,300km (800 miles) of hiking trails (and 1,500 bears). Humming Elvis as you hike is entirely optional. 109,150 sq km (42,143 sq miles).